Salmon Cheesecake, is a savory cheesecake, that goes very well at parties. This is one of my favorite dishes to serve at a cocktail party. Cheesecake doesn’t have to be be sweet, you can have a savory cheesecake as well. I believe the first time I spotted this recipe was when I was flipping through a Taste of Home magazine. I must admit I was a little skeptical of this when I first this recipe, but you know, I will try just about anything at least once. I like to let this cheesecake warm slightly to room temperature, the flavors come out better this way. You could slice this very thin and eat it as you would normally each a cheesecake, it is also quite good spread onto crackers. Yield: 12 – 14 servings. You can enjoy a savory salmon cheesecake as a savory appetizer. Before starting the cheesecake the heavy cream, cream cheese, and eggs reach room temperature before baking. Allowing these ingredients will help prevent the cheesecake from cracking. Grease the bottom and sides of a 9-inch springform pan with butter. In a small bowl combine the Italian seasoned bread crumbs and 3 tablespoons Parmesan cheese; sprinkle into pan, coating bottom and sides. In a skillet, saute onion and red pepper in butter until tender; set aside. In a bowl, beat cream cheese until fluffy. Beat in the cream, pepper and remaining Parmesan cheese. add eggs; beat on low speed just until combined. Fold in the onion mixture, salmon, and Jarlsberg cheese. Bake at 325° for 35-40 minutes or until center is almost set. Turn off oven, crack the door of the oven open a couple of inches, and allow the cheesecake to cool to room temperature before placing in the refrigerator. It is best to let this cheesecake rest overnight before serving, but you can also prepare this a couple days in advance to be served later. This was a big hit at my last party. I will definitely be tying this over the weekend when I’ve got some time to cook. 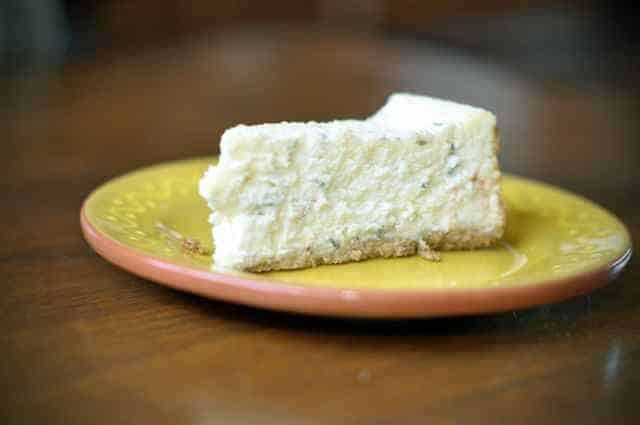 I’ve been intrigued by savory cheesecake for some time now but not inspired to jump into it until I stumbled across this recipe. I love the idea of a year of cream cheese and will follow along. Thanks for sharing. Oh wow! When I’m ready for a real treat I’m going to make more cream cheese and make this savory delicacy. It looks and sounds so incredible. Did you take the shot? It looks awesome! I absolutely took the shot, if you look real close you may see a cat hair on the table. Hopefully I fuzzed that out!